Last week’s Thursday Thoughts raised many comments from readers: which has certainly made me think a lot more about innovation in the past week! Many thanks for those of you that engaged in the conversation! My hypothesis that customers were the best source of innovation was challenged by quite a few! Given that the subject (combined with my rather over-simplistic conclusions) created so many comments, I thought I would carry on with the same theme – though this week look at the process of innovation in great companies. In my research, I came across a very interesting book: “Winning at Innovation: The A-F Model” by Fernando Trías de Bes and the famous Philip Kotler published by Palgrave Macmillan in 2015. This resonated with a thought I had last Sunday that the true source of innovation was probably not the customer, but more likely a passionate, problem-solver driven to do something new. Like Steve Jobs – a catalyst that wants to put a “ding in the Universe”. Somehow this made me feel a lot better, because it meant that this “innovation activist” could really make a difference by simply believing that they could! Activators – these are people who will initiate the innovative process without worrying about stages or phases. Browsers – these are the experts searching for information. Creators – The people who produce ideas for the rest of the group. Their function is to ideate. Developers – People specialised in turning ideas into products. Executors – The people who take care of everything to do with implementation. Facilitators – Thos who approve the new spending items and investment needed as the (team-defined) innovation process moves forwards. The book gives a chapter to each role. Rather like a Jazz band, the magic only happens when the players perform their parts with each other by getting “in the groove”. How far away this model is from the classic “Stage Gate” process! So many large companies try to institutionalise innovation by forcing new ideas through a series of gates, each gate blocking innovation and creating an economy of scarcity and innovation prevention agents. Some might say it is a game and chant “gamification”, but that is not my experience. Innovation is everybody’s job – and everybody’s right! By defining roles and allowing the players (within a scope / budget / set of objectives) to define their own process (or set the rhythm to their own music), innovation flows naturally. No need for costly gates and financial cook-books. I call this idea “Presence over Process”. Think about it. It really helps if you are struggling to navigate any corporate or government process. Long live the spirit of Jobs and all other innovation activators! That also gives a clue to next week’s piece. But it probably isn’t the Jobs you think it is! Surely the customer is more often the source of inspiration for innovation, rather than predominately an innovator. Within reason the customer has no interest in innovating and without encouragement does not see innovation as part of their role. Though i would suggest that liberating and inspiring innovation in the customer, or anyone for that matter, is a fulfilling experience. With regards to the ‘A-F’ model i would argue that people may well naturally specialise into those roles due to personality, personal objectives and so forth. However, without activating innovation from all of those individuals something is being missed. What is required in the end is surely the ‘encourager’, be this the space to collaborate, the culture to promote our the individual to inspire? I don’t entirely agree (having run and been run by (!) a large range of innovation and development gating processes. I think that the danger is not the process, but a gap that can develop between those who run the process and those who provide innovation. A process that assists those with innovative ideas to tease out “where is the money” and “what, actually, is the need you’re addressing”, and “who cares if this succeeds” is not only helpful but essential. Indeed it’s only with this kind of process that competing innovations can be compared and prioritised. In short – ideas without process – chaos; process without ideas – dead hand. Interesting. The A-F model makes a great deal of sense. I would add the following to the mix: culture and brand. Small Start ups don’t tend to have managers. It’s much more of a collective, with (hopefully) a fun, probably slightly edgy feel. ‘Anything is possible….’ Etc. Brand is really low down the list of priorities as it does not exist in the early days. Thus, there is no risk of damaging the brand in an attempt to innovate. However, success leads to growth, and managers, and brand protection in a world where a careless mistake can cost, ‘big time’. (Doing a Ratner). The critical thing here is the A’s and the F’s. For the A’s, Who sets the vision, dreams the dream, says ‘what if’? And critically, do they have enough status within the company to be listened to, and to be a subsequent stakeholder with appropriate reward. For the F’s, beware the dead hand of financial control which can cost the risk reward ratio in such a tightly controlled manner that the C’s D’s and E’ are never able innovate with the appropriate level of freedom. I started in a private company with 24 offices in UK, that now is a plc which has approximately 650 offices globally. Whilst very successful, I have seen how brand management and cost control can change attitudes. As for the dinosaurs, I was once told a quote about the US train service along the following lines. ‘They made the mistake of thinking they were in the railway business. By the time domestic aviation arrived, they realised too late that they were in the transport business’. I guess we must always have one eye looking over our shoulder at what might be about to disrupt our business model. An interesting and useful piece, thank you; especially so as innovation and development is not an area where I’ve worked in previously. While I see why you’d be against the Stage Gate model it seems to me that the main function of the gates is to ensure that limited resources are devoted to the most promising innovations; within the A-F model where does that function lie? 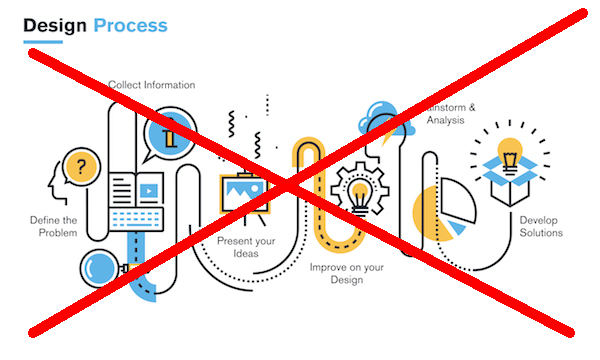 I think that an informal process apparently run solely by the people with a stake in the outcome of that process will inevitably fall foul of a whole swathe of human biases, who wants to be the innovator who stops the project everyone else is enjoying and so optimistic about? In order to fill this absent function I’d therefore propose a eighth role for the team ( the seventh role being – from a quick read up on the A-F model online – a project manager to oversee the first six roles ). And while I’m inherently suspicious of a model where the roles fall conveniently into the first six letters of the alphabet, and I’m damned if I can find a non-gendered term, I’ll go with G all the same, so “Gunman” it is. A Gunman is someone whose aim is to kill projects, but with the higher objective of freeing up resources for other more promising work, or to highlight at an early stage the problems that the innovation might face in a few weeks, months, or years’ time. There are enough “innovation prevention agents” as it is, so while it is a very adversarial role the Gunman’s objective isn’t to defeat the project team; the objective is to force the project team to foresee problems with their innovation in advance of more expensive stages in the process so they can remediate them now, or to illustrate issues they haven’t foreseen that mean that the project is simply not viable. Is this a useful addition to the process, and a way to take advantage of a personality type that wouldn’t fit into the original set of roles? Or is innovation hard enough as it is without adding additional obstacles? Love it, Nick. Thanks so much for a really useful addition to a somewhat theoretical process!